Croatian Government follows the highest standards of openness, transparency and inclusiveness. That is why Croatian citizens can communicate in a modern, simplified and quick way with the public administration that delivers public services via number of available e-services. By using the system, citizens can request electronic copies of birth certificates, marriage or life partnership certificate, ask for electronic records of residence or owned vehicles and many other documents. In a short period of time, project has been recognized by the citizens, media, public administration and non-governmental organizations. In October 2015, system had more than 209 000 unique users that made 13.000 logins in e-services daily. The most popular e-service is Personal inbox with more than one million logins, followed by CIPI electronic record with over 405 000 applications and e-Matice with more than 292 000 logins. 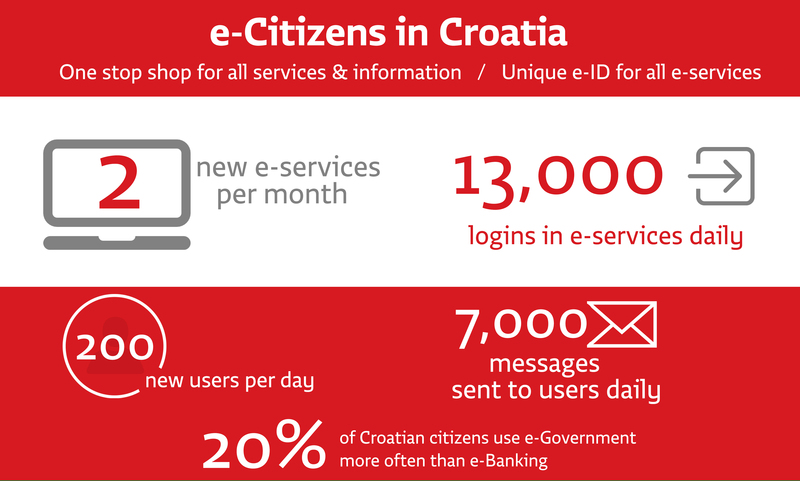 The e-Citizens system, except for the growing number of users, also records increase in number of services offered. Of the initial 14 services, system has grown to 27 services and by the end of 2015 three more will be added: criminal records bureau certificate, registration of a newborn child and a certificate of the student status. Helpdesk for e-Citizens is available during business hours on the phone: 072200027 or via e-mail: pomoc@e-gradjani.gov.hr. 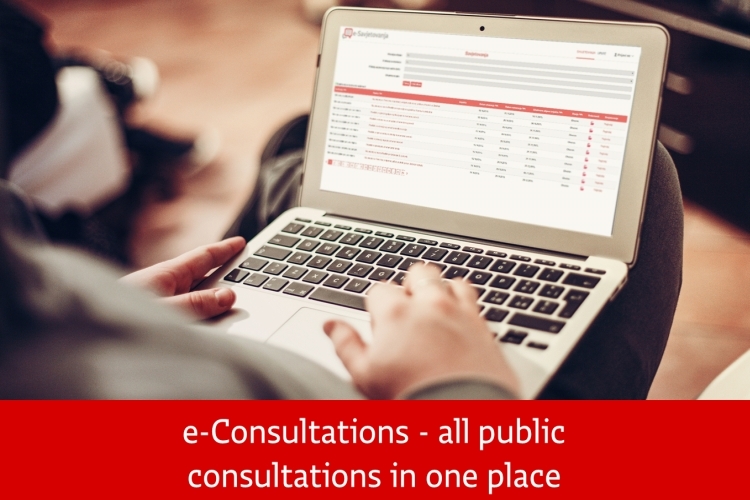 Portal "e-Consultations" provides citizens with easy access to all currently open consultations on regulations, laws and acts issued by public authorities. Number of registered users is growing daily and in the first two monts 1 600 citizens registered for this e-service. In the first six months more than 2 500 users (1 509 individuals, 151 organizations, 510 companies, 131 crafts) registered and 27 state authorities launched a total of 269 consultations that received 3.237 public comments. We invite citizens, non-governmental organizations, businesses and other representatives of the public to participate in the open consultations on law proposals and other regulations as well as to continue to improve quality and openness of the process of shaping public policy in the Republic of Croatia. This automated system provides information on the current status of the court case at the national level. System can monitor the status of cases at municipal, county and other courts, list of case participants and other important information about the case. It enables monitoring and provides detailed statistics on the work of the courts, verdicts, court minutes and other reports. Electronic data exchange with other systems is carried out through the portal e-Case and basic information on court cases is publicly accessible via e-Bulletin Board. Being one of the measures for suppression of grey economy and unfair competition, fiscalization was introduced in many countries, according to different models and IT solutions and with different experiences. Croatian solution is based on the first online fiscalization system. Fiscalization of cash transactions is a set of measures implemented by fiscalization subjects in order to allow efficient oversight of realized cash turnovers. Croatian solution is an open solution that enables online working mode without time delays. This has reduced possibility of tampering with receipts because every receipt is delivered to the Tax Administration in real time. Digital certificates are used to ensure authentication of user and protection of data. Unique Receipt ID number issued by the Tax Administration guarantees that the receipt is valid and enables citizens to check its authenticity. 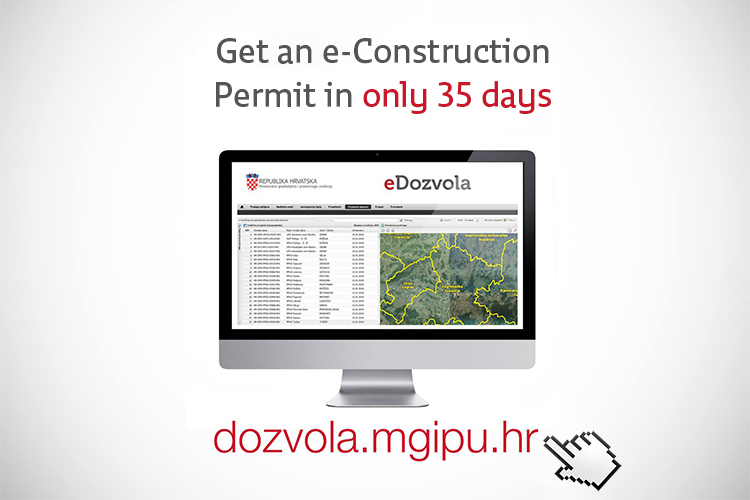 This information system is used for issuing construction or building permits in all Croatian counties and cities. The main goal of this centralized system is to raise the quality of administrative and non-administrative procedures by simplifying and speeding up the procedure. data.gov.hr is a data hub used for collection, classification and distribution of open data produced by public sector. This data can be used to create added value or economic benefits in commercial and/or non-commercial purposes. Project aims to improve the dissemination of public open data through a unique and central place and enable implementation of innovative non-commercial and commercial applications. The goal is to intensify cooperation with the private sector, particularly in the field of information technology and to originate improvement of electronic public services as well as increase of transparency of public administration. List of applications made with data published on the Open Data Portal is available here. 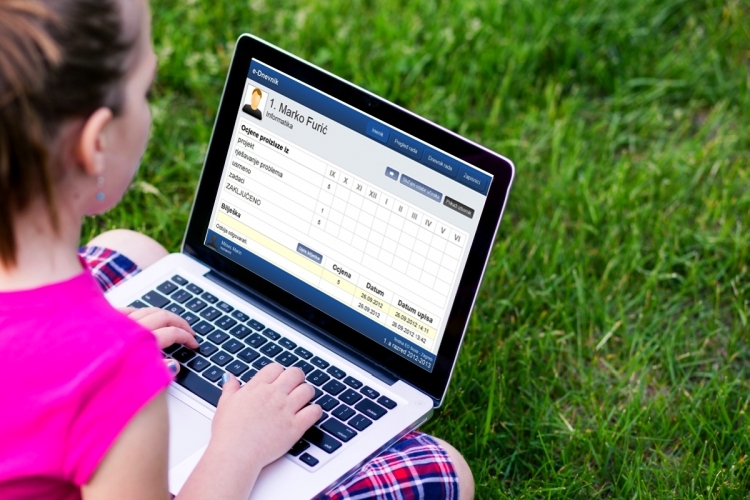 The e-Class Register is a web application for the management of the class registry in an electronic format. The application fully replaces the paper documentation with additional functionalities enabled through the use of IT. The result is a transparent, easy and quick online enrollment in the desired school without unnecessary administrative work, both for parents, students and the school. The e-Employment Record facilitates citizens' access to information on work history and former employers. With e-Employee Registration system employers can electronically register their employees and make changes related to pension insurance and other. Application for health insurance is done automatically and there is no duplication of the process or need to queue at the counters. The project goal was to create and implement the national electronic system of booking medical appointments. System has connected over 5000 primary healthcare practices, over 60 hospitals, 400 clinics and primary healthcare centers. Booking medical procedures became easier and quicker. Thanks to this project, patients in rural areas do not need to travel to hospital just to schedule an appointment.